Mumia Must be Freed Now! Upcoming international united-front protests demand Mumia’s immediate freedom: Sydney, Australia, on April 23; Mexico City on April 24; Chicago and Los Angeles on April 26. For more information: www.partisandefense.org. 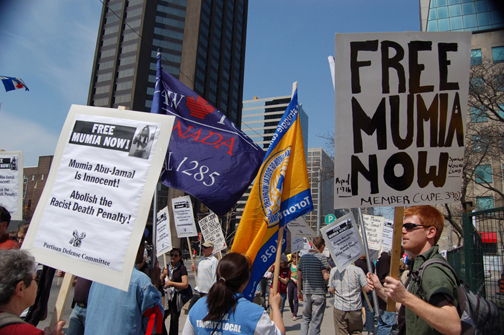 As part of the international campaign initiated by the Partisan Defense Committee to free death row political prisoner Mumia Abu-Jamal, united-front protests took place on April 19 in Oakland, Toronto and London under the slogans: “Mumia Abu-Jamal Is Innocent! Free Mumia Now! Abolish the Racist Death Penalty!” The same day, a protest initiated by the International Concerned Family and Friends of Mumia Abu-Jamal in Philadelphia drew some 600 people, and another called by the Collectif unitaire national “Ensemble, sauvons Mumia” in Paris drew some 200 demonstrators, while 50 people came out for a protest in Mexico City called by Amig@s de Mumia. 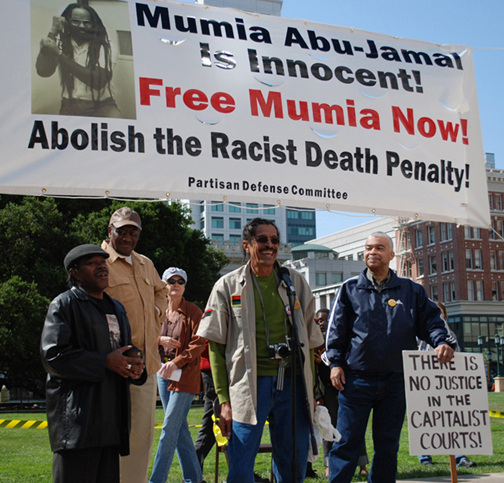 The protests were called in response to the March 27 U.S. Third Circuit Court of Appeals decision upholding Mumia’s frame-up conviction. Chanting “Mumia is innocent! Free him now! Labor has the power to make the courts bow!” the PDC and LBL-organized Class-Struggle Contingent in the Philadelphia protest drew some 150 people, including trade unionists from NYC’s powerful Transport Workers Union Local 100. The contingent marched under the slogans, “Mumia Abu-Jamal Is Innocent! Free Mumia Now! Abolish the Racist Death Penalty! 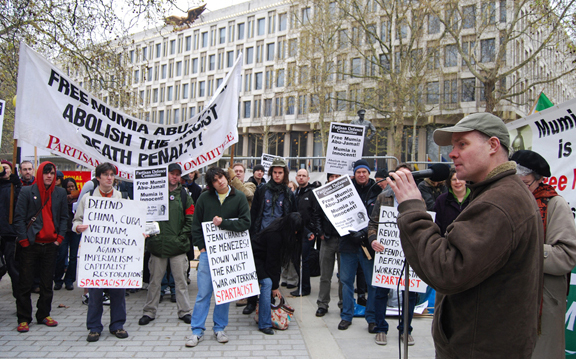 There Is No Justice in the Capitalist Courts! Mobilize Labor’s Power—For Mass Protest!” Philly cops acted to protect fascist vermin who came to attack the demonstration. Marshals from the PDC/LBL contingent effectively repulsed a fascist provocation against the protest. As PDC Labor Coordinator Gene Herson underlined, “It is not an accident that the race-terrorist fascists, the deadly enemies of labor, blacks and all the oppressed, have come forward as the stormtroopers for those who seek Mumia’s legal lynching. It affirms that the cause of Mumia is the cause of labor, the cause of black freedom, the cause of all the oppressed.” In Paris, a Class-Struggle Contingent organized by the Committee for Social Defense, the PDC’s fraternal defense organization in France, drew some 60 people, while in Mexico City, members of the Grupo Espartaquista de México, section of the International Communist League, joined the Amig@s de Mumia protest and addressed the demonstrators. On April 12, a Class-Struggle Contingent of some 80 people built by the Committee for Social Defense in Germany marched in a demonstration for Mumia in Berlin of about 300. PDC counsel Rachel Wolkenstein, who served on Mumia’s legal defense from 1995 to 1999, said, “The fight for Mumia’s freedom is at a critical juncture. 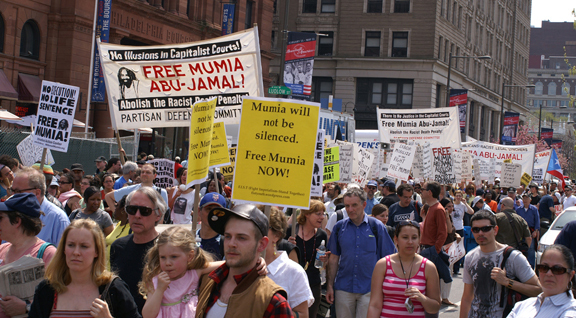 The statements in defense of Mumia must be turned into mass action, centered on labor’s power. We call on everyone to redouble their efforts to build the upcoming united-front demonstrations.” United-front protests will take place in Sydney, Australia, on April 23; Mexico City on April 24; Chicago and L.A. on April 26. For more information: www.partisandefense.org.